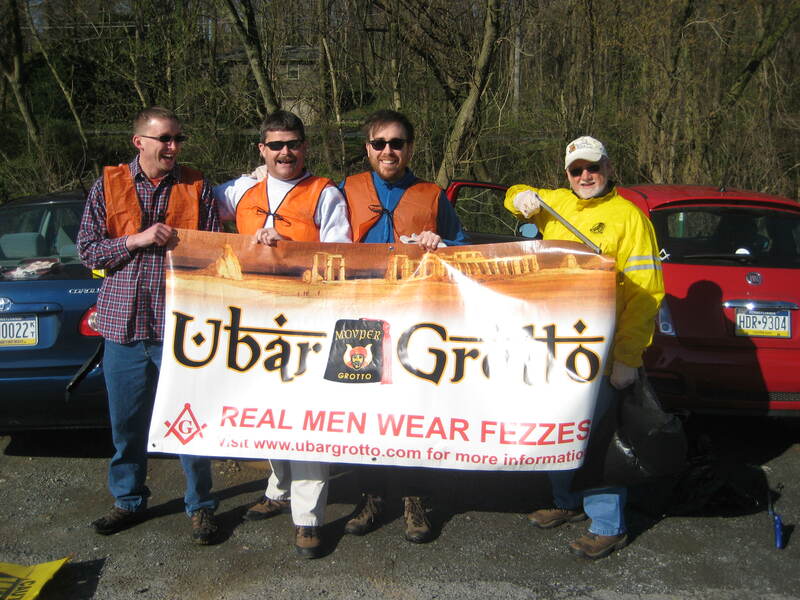 On Saturday, April 13, 2013, 6 members of Ubar Grotto donned the ever flattering orange vest and trod along highway 283 for our first highway cleanup of 2013. Ubar Grotto adopted a section of route 283, between the Elizabethtown / Rheems exit and the Snyder Road over pass. This section of highway is rough a mile and half long and Ubar is responsible cleaning up the sides of both lanes of traffic. Saturday’s cleanup was spearheaded by Pro. Abe Shaffner, known locally as the Kraut King of Lebanon County. Assisting him were 5 other Prophets – George Hindson, Monarch Pro – Tem; Russ Baker, Trustee; Dave Chittister; Mark Mattern, Captain of the Guard; and Seth Anthony, PM, Secretary. The group started working at 9 AM and finished around 12:15 in the afernoon, providing a good work out for all involved. In total, the Prophets collected 55 bags of trash. They also observed several varmints that met their end on the highway, including a skunk, a racoon, two birds, two cats, a groundhog, and two other unidentified critters. Thankfully, the men didn’t have to clean those up! All in all, it was a great day for the activity and Ubarians can take pride in a well cleaned section of highway!